Centrally located on 5 acres, We had a vision for AAS von Tente Kennels of a single facility where dogs could exercise, be properly trained, be professionally groomed, and board without anxiety and stress. We wanted a peaceful, park-like setting away from highways, busy intersections, and urban congestion. The result is a clean and beautiful facility where your pets are treated like family. Whatever your needs, AAS von Tente Kennels is here to serve the Southwest Florida community. • We are members of the USCA - United Schutzhund Clubs of America and members of the German Shepherd Schutzhund Club of Southwest Florida. • In Germany we were members of the SV, OG Wermelskirchen and OG Burscheid between 1973 to 1996, we trained dogs in Tracking, Obedience and Protection. • 1996 we came from Germany, with are german shepherd dog Falco, to the United States. • 1997 we started with Show dogs and Breeding. • During that time my wife, Anke, has worked in grooming shops, dog kennels and Vet offices as a boarding helper and Vet assistant in our area for years. • In 2000, we bought 5 ac in North Fort Myers, Florida. • 2004 we opening AAS von Tente Kennels for business. Falco was the foundation and motivation for our company. • In July of 2007 we fulfilled our dream of becoming American citizens. 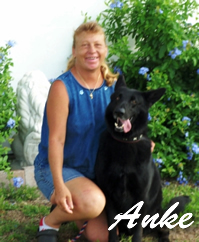 • 2008 we co-founded the German Shepherd Schutzhund Club of Southwest Florida. 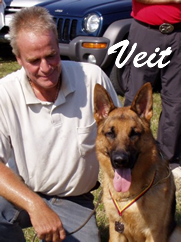 • 2009 Veit become an AKC-CGC Evaluator and an Certified Dog Trainer. • 2013 President of the Southwest Florida Schutzhund Club.